Merchants Court01263 715779work01603 870304fax Self-cateringThis superb three-storey townhouse sits only a short walk from the popular beach of Cromer. Featuring excellent ocean views, comfortable furniture, and modern utilities, guests can make the most of their stay in this idyllic part of the Norfolk Coast. Cromer enjoys a large selection of pubs, shops and restaurants amongst many other attractions. Merchants Court offers weekly bookings starting on Saturday. 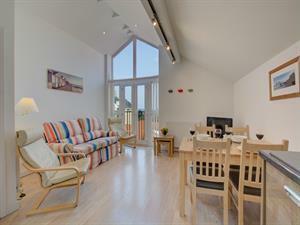 This superb three-storey townhouse sits only a short walk from the popular beach of Cromer. Featuring excellent ocean views, comfortable furniture, and modern utilities, guests can make the most of their stay in this idyllic part of the Norfolk Coast. Cromer enjoys a large selection of pubs, shops and restaurants amongst many other attractions.